Do you need help starting to build your WRAP? Well, this audio download is perfect for you! 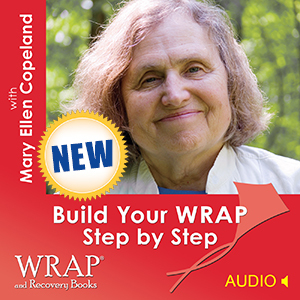 Mary Ellen Copeland, author of Wellness Recovery Action Plan, WRAP Plus and WRAP for Life, and more, will help you along the journey of creating your WRAP. This is a downloadable program that will take the listeners step by step through the process of building their own WRAP. Mary Ellen goes over all the steps, one by one with plenty of examples. She will help anyone get over the hesitation of building their WRAP and get on the road to wellness. Included in the download are all the WRAP forms you will need to build your own WRAP notebook. The plan can also be created with the WRAP APP, the WRAP Workbook, or in the Build Your Own Wrap Course, which are all available in our bookstore at WRAPandRecoveryBooks.com.